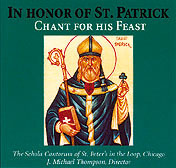 Recorded for the first time on any label, the First Vespers and Mass for the feast of St. Patrick are now available on In Honor of St. Patrick. Transcribed from fifteenth-century Irish manuscripts, these Latin chants are sung, perhaps for the first time by anyone since the Reformation, by the Schola Cantorum of Saint Peter's-in-the-Loop. In Honor of St. Patrick presents Vespers in its entirety, word-for-word as it would have been heard in the late 1400s at St. Patrick's Cathedral in Dublin. The choral chant for the Mass is also included. This is a rare opportunity to hear a local dialect of Gregorian chant. The CD booklet provides the texts in Latin, English, and Irish.